The Leifheit Tower 450 dryer is designed to be flexible for different drying needs and can be used inside as well as outside the home. 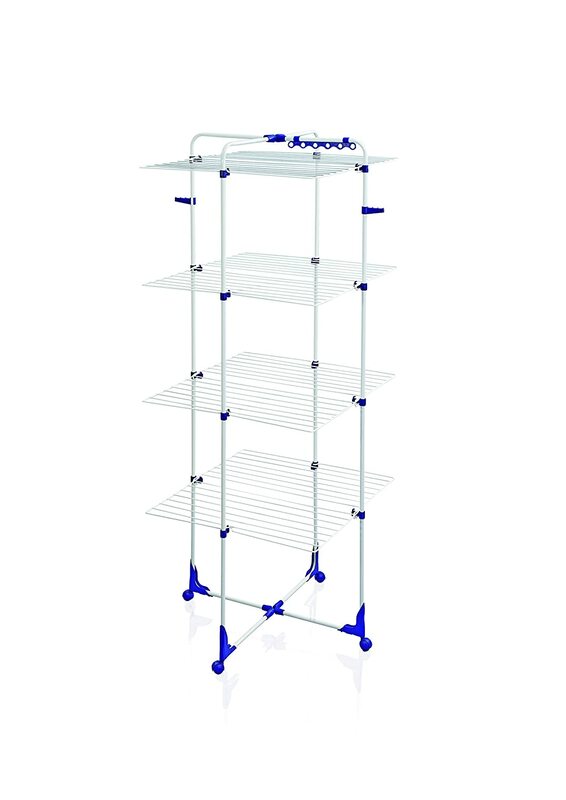 Extra tall, it accommodates up to five washing machine loads and provides a spacious 45 metres of drying space, ideal for drying long laundry. It is equipped with practical extras, providing two coat hanger holders on either side of the dryer's frame as well as 6 hanger loops at the top. The dryer stands steady with a strong robust steel-frame to support heavy washing. To maximise the use of the whole dryer, the frame is opened with the four tiers hinged horizontally. For space saving, the dryer can fold in half and stand flat against the wall or radiator. With 360 swivel wheels, the dryer is portable for around the home, providing the added ease of moving it on a flat surface, even when fully loaded. To suit drying different laundry lengths, each tier is adjustable, either set horizontally or left vertically. Drying rails are strong, durable and plastic coated to protect against rust forming. The dryer stores flat for convenience. Each shelf swings vertical and dryer folds inwards. Open: H 176 x W 69 x D 73 cm. Closed: H 171 x W 69 x D 6.5 cm. Leifheit's wide range of Airers and Dryers are designed for practicality, ease and functionality and are sufficiently robust for frequent use. Leifheit offers something for every home. For over 50 years Leifheit has been one of the leading suppliers of household goods in Europe and - true to their motto - have "always better ideas". Their innovative products with trendsetting designs are of highest quality and are one of the characteristics of the Leifheit brand to make life at home easier and more convenient. Leifheit's laundry care products are well made to ensure laundry is fresh, clean and well kept whilst aiming for maximum functionality and attractive design. I have considered having one of these airers for some time. The radiators in my house are never on enough to dry/air clothes successfully and so I have a standard clothes airer which is great, however I need more space and so this seemed the ideal answer. However, I was not impressed and I don't think it is right for me. I first tried it with towels - however if you hung a large towel on the top, you couldn't use any other shelves because it hung down. You also couldn't hang a towel on the outer bar because the racks rest on a bracket at the end, which also cut out drying space. Wet towels are heavy and I did not feel confident that with regular use that the bars would last for a long time. I then tried it with a regular load and there is lots of drying room for underwear etc however I had similar problems with not being able to hang long or bigger items but small underwear is perfect. I did like option of unclicking the lower shelves to let long items hang down and the unit remained sturdy with less shelves in. This also meant that when ironing I could have the unit beside me and hang the shirts on hangers. The unit also stores really compactly with all the shelves hanging flat so it can be stored behind a door or in a cupboard with ease. In summary I think i am going to stick with my usual airer and use curtain poles to hang bigger items when I need to get them dry. I received this item in return for an honest review through the Amazon Vine Programme. 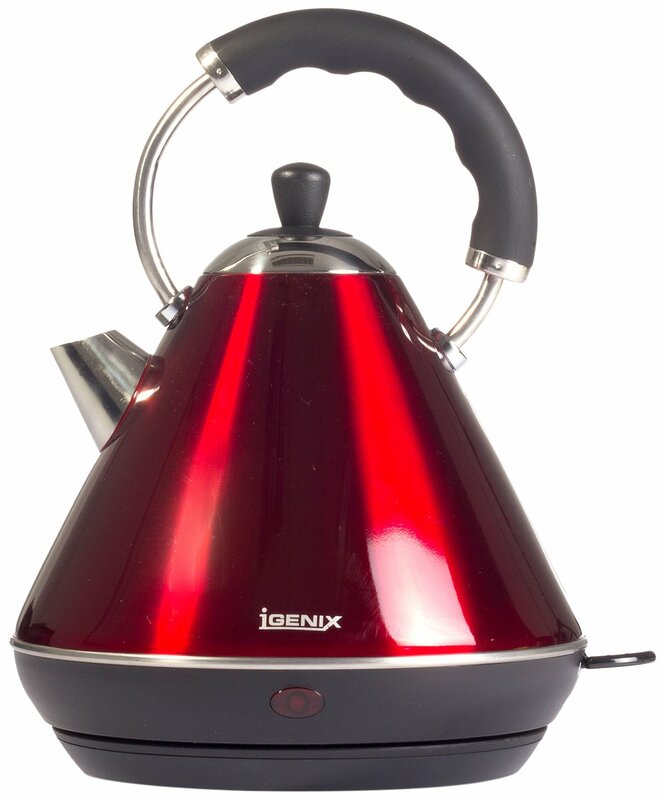 Igenix IG740R stylish 1.8 L cordless traditional kettle comes with a special designed handle with soft grip for easy pour action. It features a rear water level indicator window, concealed element, auto cut off when the water boils and a removable washable filter. It has a 360 degree base for right and left handed use and has a large 1.8 L capacity. The kettle is also available in cream Igenix model IG740C. I have never had a stylish kettle. I don't drink tea or coffee and my husband isn't bothered what the kettle looks like as long as it boils water for his morning cuppa he is happy. However I fell in love with this kettle as soon as I saw it and when I got it delivered and opened the box I loved it even more. As far as I am aware, a kettle is a kettle - it boils water and that is it. Well, yes this one ticks that box although my husband does believe that i is slower than our old, borning, jug kettle but it isn't that slow so I am not marking it down on that point. The only negative I can think of is that the water indicator is difficult to read - it is at the back of the kettle and when I was filling the kettle from the tap it was closest to me and therefore I think in my shadow and I had to take it away from the tap to read the measure. I love the bright, shiny red exterior and I also really like the shape of it. Its base design means that it can be swivelled for either left or right handed people, and it's handle shape and design keeps hands well away from the steam, meaning no chance of burning fingers. The handle has a good grip and is comfortable hold. In summary I would say this is a beautiful design and a good kettle to put in any kitchen. I received this product through the Amazon Vine Programme in return for an honest review. The ALEX Toys - Craft, Do-It-Yourself Card Crafter, 107C lets you make homemade cards for any occasion. No need for a store-bought card when you can design your own with a personal touch. With (250) pieces in this kit, there are endless possibilities! Stamp your own patterns and create 3D layers! The card set includes (12) printed cards, (12) assorted envelopes, (101) stickers, (47) paper shapes, (30) sticky gems, (40) adhesive foam squares, (3) wooden stamps, stamp pad, (2) rolls of washy tape, twine, glue stick and easy instructions. ALEX is renowned for producing quality craft projects for children of all ages, and this year is no exception. Our signature detail and creativity continues with wonderful new introductions, turning classic crafting into modern projects with a sophisticated look and finish. Parents love the quality ALEX puts into traditional crafts, and kids love that we make them trendy! 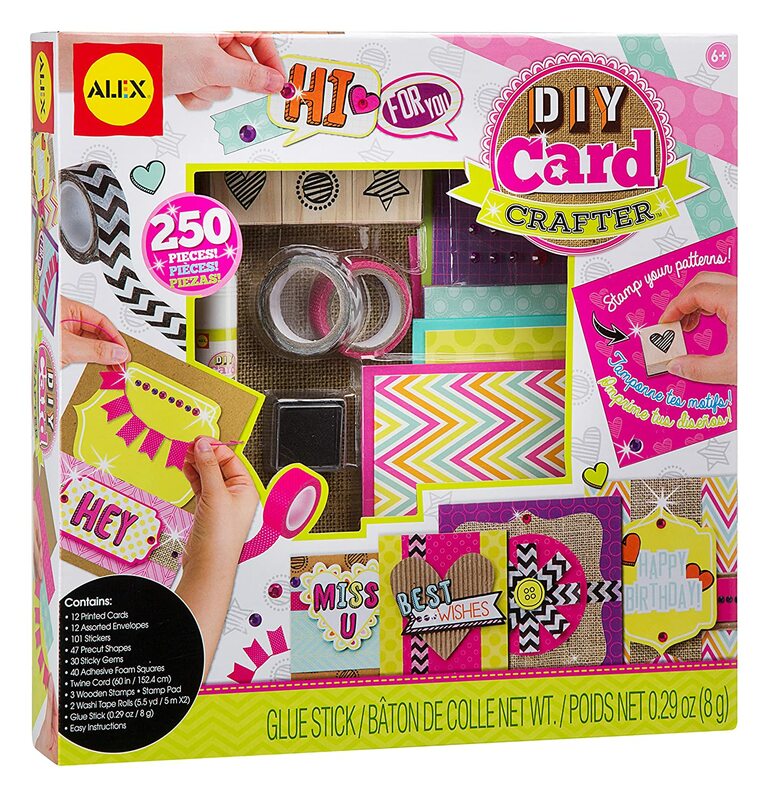 The ALEX Toys - Craft, Do-It-Yourself Card Crafter, 107C is recommended for children age 6 and up. ALEX Toys takes the mission of providing children with quality creative products that foster personal expression and build self-esteem to heart! ALEX products are currently sold in over 80 countries worldwide in specialty toy and retail shops. I make hand made cards myself and have sold quite a few and so I think i am well aware of the craft making materials on the market. I like to use good quality materials but I am not always keen to 'share' my materials with my children when they want to have a go. To give my daughter her own crafting materials kit would solve this problem and this fits the bill perfectly. There is a great selection of crafting materials contained within the kit and includes everything, except a pair of scissors, to get going stratght away, including a glue stick. The kit enables children to have a go at a number of card making techniques, with wood stamps and ink pad, stickers, sticky gems and precut shapes all included, which when mixed and matched will make some fantastic cards for children to send to their friends and families. The current Amazon price is £14.99 which is a reasonable price, when the individual components are priced up. I reecived this product through the Amazon Vine Programme in return for an honest review. A fantastic present to give to a child this Christmas time. Safety Auto-Shut Off - The iron will switch off after 30 seconds if left on the soleplate or after 8 minutes if left on the heelrest. Vertical Steam - iron out creases in curtains or hanging clothes. I seem to get through irons at the rate of least one per year. I only do my family's ironing, unlike my mum who takes in ironing too, but I don't seem to have much luck with irons. Therefore I have tried out many brands and different styles over the years. This iron is by Phillips, a brand I have used many times and one I keep coming back to as one of my favourites. It is a light iron, I used to think that I preferred heavier models but am now becoming a firm favourite of the lighter ones. It is easy to hold, fitting nicely into my hand, without the need to stretch fingers round the handle etc. It heats up quickly and the temperature is easy to control with an accessible dial, however i did think that the maximum temperature was cooler than previous irons I have owned. The soleplate is great - I have not managed to scratch it or leave dirty marks on it, like other irons I have used and it glides easily over all fabrics I have tried. It also irons well and no crease has beaten it so far! The iron's power cord is not the longest I have seen on irons, it would benefit from being extended by 50cm. The only other fault I could find was the water reservoir - it only holds 270ml of water, which I found to empty quickly - however I do do a large amount of ironing at one time and therefore maybe I need to buy a model with a larger reservoir. Also the reservoir has a cover over to stop spillages, which is a great asset, however I am right handed and I found the hinge on the cover to be awkward - I would prefer it to open the other way to make it easier to use a jug to fill it with. 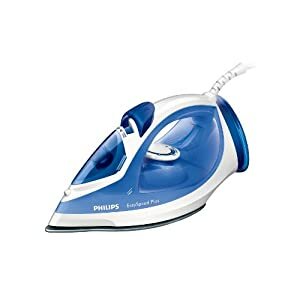 In summary, I would recommend this as a great iron for a student leaving home for the first time or for someone who does not have huge amounts of ironing to do, however for myself, as a busy mum, I would prefer an iron with a larger water reservoir and longer flex. I received this iron, through the Amazon Vine Programme, in return for an honest review. Edge Beanbags Techbed - A Beanbag Tablet Stand Pillow Bean Bag Cushion Holder for all iPad iPad Mini iPad Air Surface and other ebook readers - 25cm x 25cm x 31cm bean bag. The Techbed is a genius accessory for all Ipads, notepads, ebook readers and notebooks. Rest your device on a chair arm or snuggle up in bed, the Techbed keeps the device easily balanced - no slipping and sliding. We use the same top upholstery grade fabrics to ensure a hard-wearing but soft feel finish for your techbed. I can not congratulate this company enough on their customer service & fantastic service. I placed my order, the next day I had confirmation that my Techbed had been despatched and then Philippa rung me the next day to tell me it would be delivered that day and even gave me a 1 hour time slot of when it was to be delivered! I have not received such fantastic service from any other company. The Techbed itself is a simple product design but it works so well. I was surprised when it arrived at how light the product is. I think I was expecting a heavy Techbed but it is so light. I assume it is filled with bean bag filling or something similar. It fits a range of size hand held devices - I have used it for my kindle paperwhite, samsung tablet and also samsung mobile phone and they all work perfectly. I use it while sitting on the sofa, at the kitchen table or lying in bed and it holds the device at the perfect angle every time. Fantastic invention, recommend to all. I suffer from neck and back pain and have been looking for a pillow to support my neck for some time. I usually sleep on my side or front and so wanted something that would support in either position. I think that I have an answer to my hunt in this pillow. 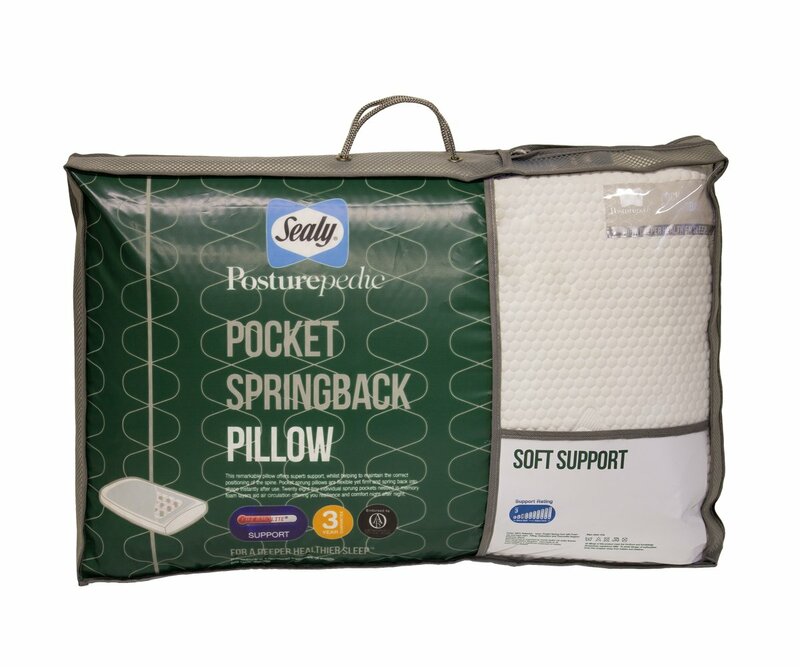 The Sealy Posturepedic pillow is soooo comfy! It is quite a large pillow and I must admit I haven't tried to find a cover for it yet but I think it may need a slightly larger than usual pillow case to cover it comfortably without it being squashed. This pillow is a soft support but it was supportive throughout the night and I did not feel that I was sinking into the pillow. When I lifted my head in the morning it immediately sprung back to its original shape and was very tempting to just have five minutes more. The pillow looks expensive - it is very well made and has a beautiful quilted top and bottom. It also feels luxourious, and therefore could easily be used without a pillow case. I would definitely recomeend this to anyone looking for a new pillow. It is supportive and well made, while looking very expensive. I received this product in return for an honest review through the Amazon Vine Programme. When the Lego Friends series of Lego originally was released, I was lucky enough to see some of the first kits through a research panel on an online forum - the outcome was that as with all Lego kits they were fantastic kits, however why the pastel colours? Lego is unisex and does not need to be sugary pink and purple to attract girls to play with it. The debate has continued and I think that Lego have listened to the consumers. This Lego Friends kit is, dare I say it, more gothic! Blacks, pinks, blues and yellows make up the kit and it is a much nicer colour palette. The actual model will appeal to girls, but I think that it will also appeal to boys too. 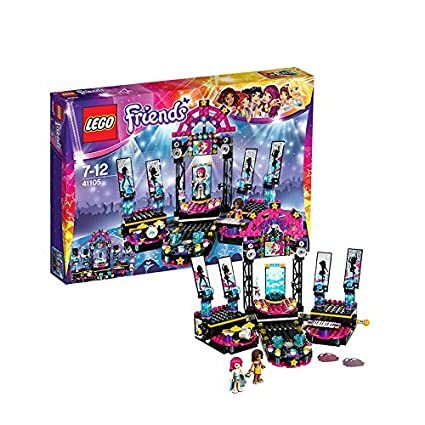 Lego have released a number of Pop Star Lego Friends Kits and so this can be added to with other kits. This kit is one of the more expensive kits from this range but there is quite a bit for children to construct and will keep them amused for a number of hours. There are some tricky bits in the construction of this kit, but as with all Lego instruction booklets, there are fantastic step by step instructions which children age 8+ will be able to follow with little or no help from others. This would be a great gift to give to children aged 8+ that they will love to build and love to play with for many hours.